Slice about 1/2 inch from bottom of fennel, and discard. Slice fennel very thinly on a mandoline or with a knife, starting with flat bottom side. Toss in serving bowl with salt, pepper and lemon juice. Trim all peel and pith from oranges. Holding peeled fruit over bowl containing fennel, use sharp knife to cut sections from membrane and let them drop into bowl. Squeeze remaining membrane over bowl to sprinkle salad with juice. Add shallots, mint leaves, olive oil and reserved nuts and toss gently. Sprinkle with lime zest. Grab a piece of bread, an egg, a cookie cutter or a knife, some butter, and a frying pan. Cut a heart-shaped hole in the bread. Heat the pan over medium heat, add a bit of butter and swirl around. Place the slice of bread in pan (as well as the little heart-shaped piece) and carefully crack the egg into the hole in the bread. Sprinkle egg with a bit of salt and pepper, and cook until the bread is nicely browned on the bottom. Next, you can either carefully flip the slice of bread over to cook the other side, or you can slide the whole pan under the broiler and cook until the top of the bread is browned and the egg is cooked to your liking. 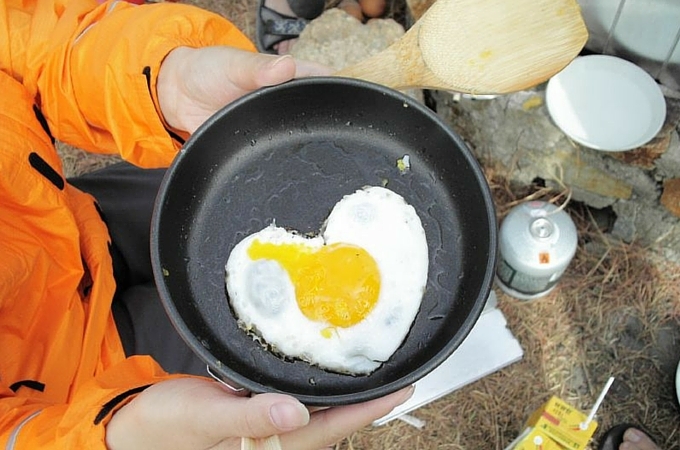 Chef Tip: To make a pink heart shaped egg: First, separate the yolk from the white, reserving each in a separate bowl and being careful not to break the yolk. Second, gently whisk in a pinch of salt and 1 tsp blood orange juice or beet juice into the egg white. Third, follow the directions for the egg in a nest using just the pink egg white. After 1 minute of cooking, carefully add the egg yolk on top of the egg white. Place under the broiler for 30 seconds and you're done!